Over the past decade the Central and Eastern European (CEE) region has seen an influx of manufacturers. One of the major sectors affected by this shift is domestic appliances. Ten years ago the CEE region manufactured less than a quarter of the appliances sold in the European Union. Today that figure has reached almost half and is still growing rapidly. As the major supplier of steels to the appliances market, ArcelorMittal Flat Carbon Europe (FCE) has responded to this shift by developing the products and competencies the region needs locally. Traditionally Germany and Italy have been the main countries manufacturing domestic appliances in the European Union (EU). Today that title is held by Poland, with neighbouring countries such as the Czech Republic, Hungary and Slovakia all gaining market share. Established European producers were first to move production to the CEE, and they are now being joined by Asian manufacturers. Almost all major domestic appliance makers are represented in the region. As the market is so highly competitive, every manufacturer expects high levels of service and flexibility from their steel suppliers. They also demand quality and innovative steels at competitive prices. These demands fit perfectly with ArcelorMittal’s philosophy of creating value for our customers. 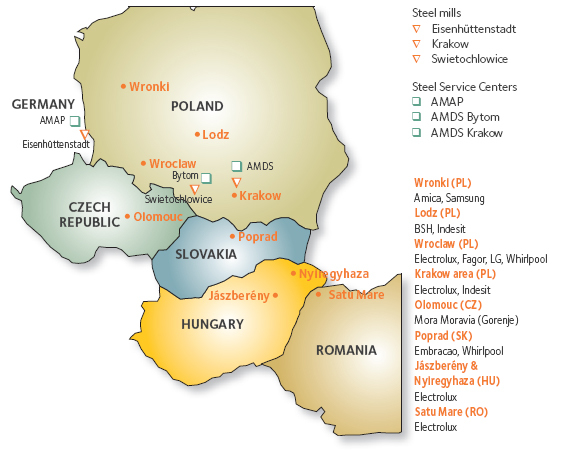 For a number of years, ArcelorMittal FCE has been investing in our facilities in CEE countries, and in mills such as Eisenhüttenstadt (Germany) which sits on the border with Poland. ArcelorMittal has also deployed its long-term Western European expertise to our facilities in the CEE, developing local competencies and skills. We have also optimised the supply chain for our Eastern European customers. By producing the steels they need locally we can deliver them faster and more efficiently. This saves CO2 and reduces both transport costs and the chance of delays. This helps to meet the just-in-time delivery model appliance makers rely on. Increasing the variety of steels available in Eastern Europe frees up our Western European plants to better serve their local appliance customers. It also provides back-up and additional capacity to meet unexpected demand. ArcelorMittal FCE meets regularly with appliance customers in order to pass on knowledge of our new and emerging products, and share the results of our research. Appliance makers are already reaping the benefits of ArcelorMittal FCE’s strategy of increasing competency and production in the East. They are also supported by Global R&D and our network of steel service centres (SSCs). With further investment already planned and new products in the pipeline, it is sure to be a long and fruitful partnership. Cold rolled annealed steels suitable for drawing and enamelling. Grades with guaranteed mechanical properties and high strength low alloy (HSLA) steels are available. Hot dip galvanised steels including soft, engineering and high strength steels. ArcelorMittal’s Easyfilm® E chromium VI-free coating can be applied to these steels. Organic coated products such as Estetic® Wet and Estetic® Cold have now entered the approval phase with our customers. New low thickness grades (< 0.4 mm) suitable for cold rolled annealing and hot dip galvanising are under development. ArcelorMittal FCE is also working with appliance manufacturers on trials of our innovative new Magnelis® metallic coating. Magnelis® ensures optimal surface protection against long-term wear and tear and can even self-heal cut edges. With its patented specific composition, Magnelis® represents a cost-effective alternative to post-galvanisation on appliance components such as hinges. Most appliances also utilise standard commodity steel grades which ArcelorMittal FCE produces. Over the past three years, shipments of these grades from our Polish mills have almost tripled year-on-year to meet local demand.